Where’s a student of Shakespeare to go when they want to make an interactive video game exploring “Hamlet?” Or what about the computer programmer that wants to code some foundational moral philosophy into their driverless car? Starting now, humanists and technologists alike can turn to a new interdisciplinary minor in Carnegie Mellon University’s Department of English. Humanities Analytics (HumAn for short and for the course catalogue) is a six-class minor based in the Department of English with classes across the university. It will provide technical training to humanities students — e.g. classes like “Machine Learning in Practice”— and humanistic training to technical students — e.g. “Intro to Critical Reading”— in the growing field of digital humanities. “This is an incredible opportunity to marry some things Carnegie Mellon is best at,” said Associate Professor of English Christopher Warren, who is co-advising the minor with Mellon Distinguished Professor of English David Kaufer. “With first class humanist inquiry and the amazing tradition of data analysis and computational scholarship, you have an opportunity to generate an incredibly powerful academic program,” Warren said. Consisting of six classes in total, the Humanities Analytics minor is available for any Carnegie Mellon undergraduate. As such, it hopes to push all variety of students into new territory. Joining a growing number of interdisciplinary programs, tech-minded students will write papers and humanities majors will code. Humanities Analytics students will learn about the processes involved in analyzing, digitizing and quantifying cultural items one might otherwise read or write a paper about — namely, texts like books, film or historical archives. They’ll use computer-assisted methods like social network analysis and text analysis to take cultural objects and turn them into data. “This minor is in many ways the new face of a humanities that can be a real partner to other disciplines, as well as take advantage of their tools," said Andreea Ritivoi, head of the Department of English. A humanistic spin on data and computational methods is popping up in plenty of fields including publishing, entertainment, information science, and the arts. The data journalist making an interactive representation of the Atlantic Slave Trade and the gallery curator creating a VR exhibition need skills in the both humanities and technology. Within the Department of English there’s been a upswell of digital humanities as well, Warren said. Six Degrees of Francis Bacon, a project Warren runs, is one of several examples. Six Degrees is a digital social network representing and analyzing the relationships of public figures in early early modern Britain based on data mined from records and existing scholarship. Like Six Degrees, Humanities Analytic students will discover a variety of computational methods to tackle humanities scholarship. Instead of reading and analyzing one Victorian novel for a literature class, Warren explained, Humanities Analytics students might analyze thousands of them using digital tools. This so-called “distant reading” helps researchers understand big bodies of culture and literature within a larger, more nuanced social context. Humanities Analytics is all about these approaches to scholarship. To satisfy the minor, students will take three foundational courses in critical reading and coding for humanities and three electives, in a list of over 50, that include classes from departments as varied as English, Computer Science, Modern Languages, Electrical Engineering, Philosophy, Fine Art, History and Robotics. Students who major in the humanities are required to choose their electives from classes in a technical field. “Machine Learning for Text Mining” and “Methods for Statistics and Data Science” are just two. From “History of Books and Reading” to “Language and Culture,” non-humanities students will select humanities electives. For technical students, the Humanities Analytics minor offers an opportunity to dig into texts and themes they might not have exposure to otherwise while simultaneously expanding their technical training. The human part is important to both Warren and Kaufer. The pun of the minor’s abbreviation (HumAn) is very much intended. Humans interested in HumAn can declare the new minor starting now. Students who’d like to do so or would like more information can contact Department of English undergraduate academic coordinator Laura Donaldson at ldonalds@andrew.cmu.edu. 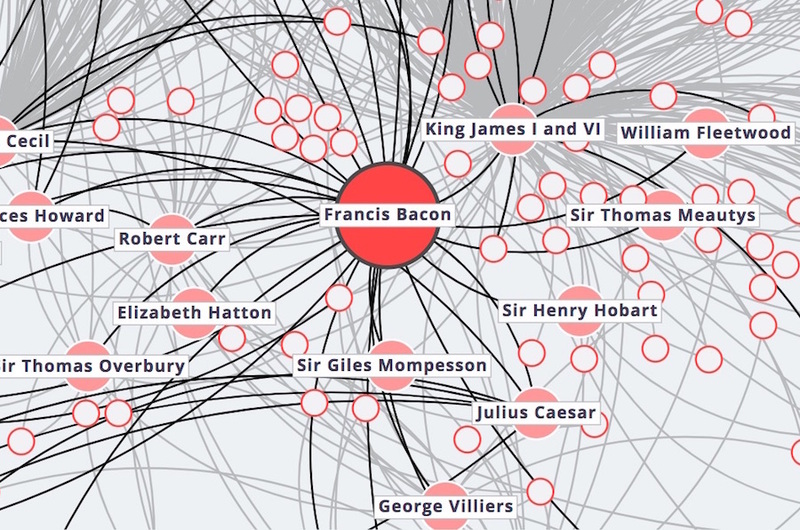 A screenshot of Six Degrees of Francis Bacon, an interactive visualizations of relationships between early modern public figures.